Beetroot and goat’s cheese is such a perfect combination – I know it’s been done lots of times by lots of people (myself included! ), but it just works so well that it seems a shame to do anything else with the ingredients. 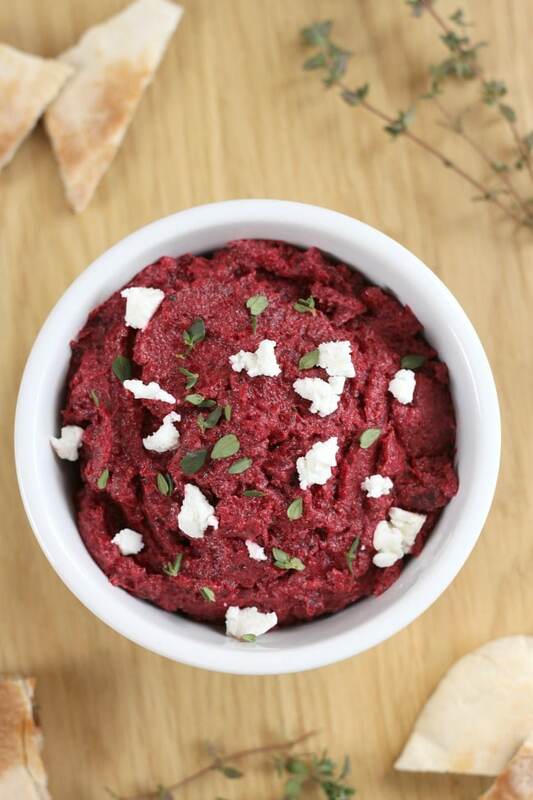 Here’s a super quick way to use the flavour combination – beetroot and goat’s cheese spread! It’s unbelievably easy to make, and only has three ingredients – roasted beetroot, creamy goat’s cheese, and fresh thyme. The goat’s cheese tastes great with the beetroot, but also serves to make the spread nice and creamy. Just throw everything in the blender – I used my trusty Optimum 9400, as usual. Isn’t it just gorgeous?! This colour is totally unedited! Since we’re getting to the end of beetroot season, I found it hard to find raw beetroots in the supermarket (even a big supermarket!) – so I actually used pre-cooked beetroots. I don’t mean the pickled kind (although, actually they’d work fine as well – the vinegar flavour mellows a lot when cooked), I mean the kind you get in vacuum-packed plastic. 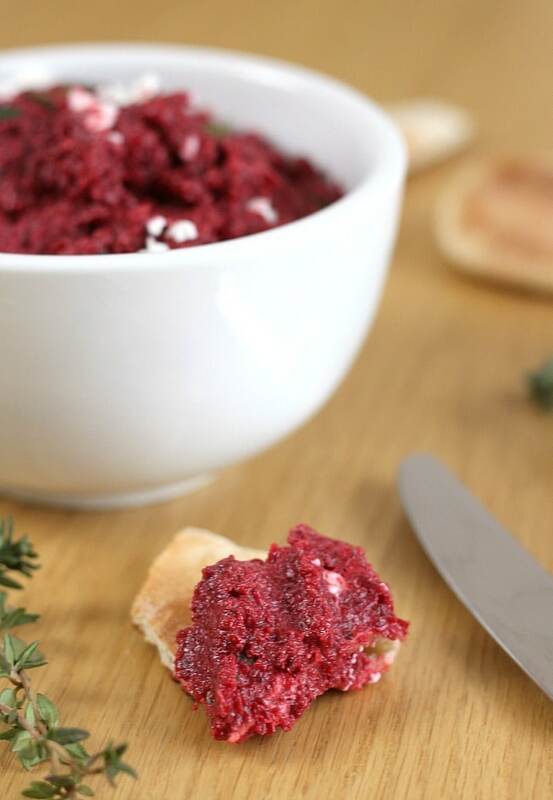 It might not be as ‘from scratch’ as using raw beetroots, but it means you can make this beetroot spread all year round. Plus, the fact that I didn’t have to peel them definitely helped to stop the spread of dark red beetroot juice across my kitchen. Just pop them out of the packet, chop them up, and you can be in clear-up mode just seconds later. Despite using pre-cooked beetroots, I still roasted them for a while – I like the little crispy bits you get around the edge, I think they have great flavour! Of course, if you’re in a rush, and you’re using pre-cooked beetroot, you can skip the roasting. 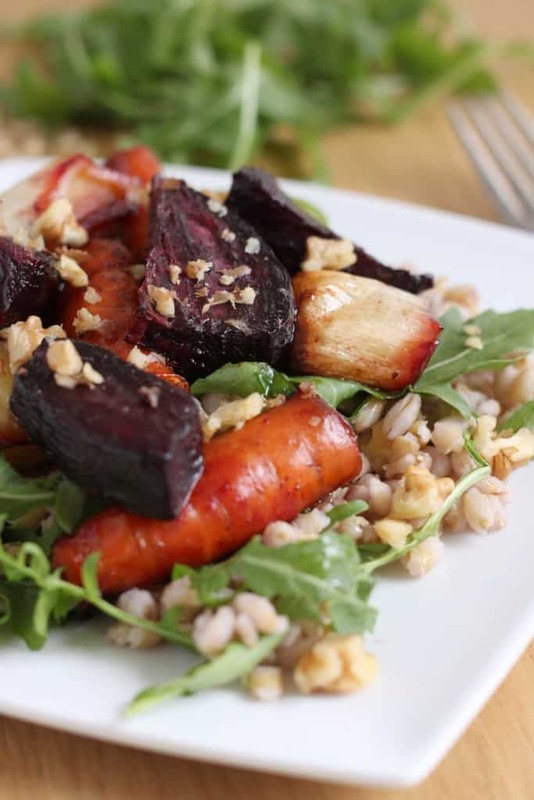 Or if you’re using raw beetroots, you might need to roast them for a little longer to make sure they’re fully cooked. Either way, serve it up with some toasted pitta bread or crackers, and you’ve got yourself a quick and easy lunch. Cut the beetroot into chunks, and toss in the oil. Spread the chunks out on a baking tray in a single layer, and roast at 190°C (Gas Mark 5 / 375°F) for around 30 minutes, until totally soft in the middle, with slightly crispy outsides. 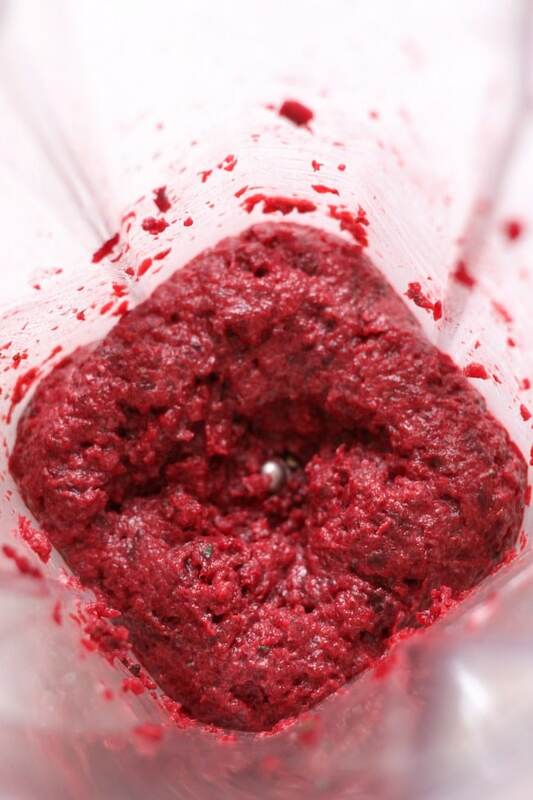 If you're using raw beetroot, you might need to roast it for a little longer. 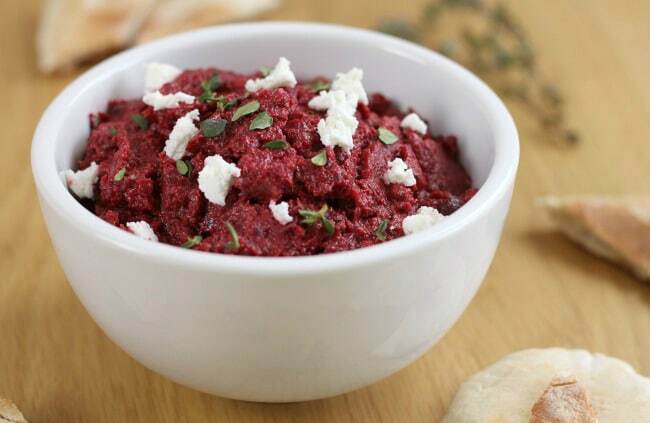 Add the roasted beetroot to a high-powered blender along with the fresh thyme leaves, about two thirds of the goat's cheese, and some salt and pepper. Blend until the mixture reaches your desired consistency. Serve topped with the remaining goat's cheese. Becca, I made this tonight; taste is great, but the colour became pale, a kind of rosa when I added the cheese. The whiteness of the cheese absorbed the deep red colour of the beetroots. Is there a way I get the intense red on your photos: -) ? All the best this weekend! Becca, thank you! The next time I will use my scale. The next time I will do it precisely by measuring all ingredients. I have a mediterranean cultural background: -) my grandmother never uses a scale: -) thought it might work, and it did, but I do care about the deep red color. Maybe there was just too much cheese then :) I never measure anything either unless I’m writing a recipe! Glad it was tasty anyway! Wow, what lovely colours! 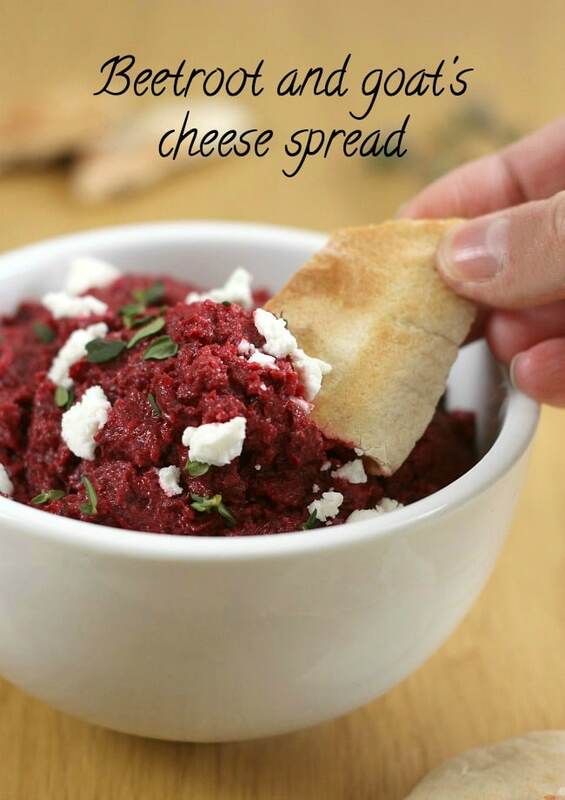 Given how much I like the combo of beetroot and goat’s cheese, I can imagine this working extremely well! 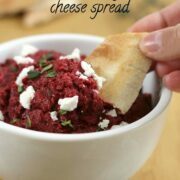 What a fab and easy spread, just wish I liked goats cheese as still to be convinved on that one! Aw it’s so nice! :P you could maybe try feta or something instead? Great recipe Becca. What would we do without our blenders? I’d be lost! It definitely makes recipes like this SO quick! Mmm, sounds delicious and looks strikingly wonderful. What a lovely simple idea, Becca! Totally doing this. I think you are right about even roasting the cooked ones just a little. It doves bring out the flavour a bit more. I think we may be luckier up here as so far I haven’t had an issue with getting beets. Only thing is that they are usually quite big these days. And a bit sorry for themselves. I discovered you blog yesterday, when I was searching for something to create with the mushrooms in my fridge. Found 3 wonderful recipes but ended up making the pasta, mushroom, spinach one because I also had a big container of fresh spinach. It was just wonderful! and so easy to make, but you wouldn’t know it. Next I have to buy more mushrooms in order to make the mushroom stroganoff. Seriously, this is the first time I’ve ever left a comment on ANY blog, but I just had to compliment you and thank you! What a great speedy dip. 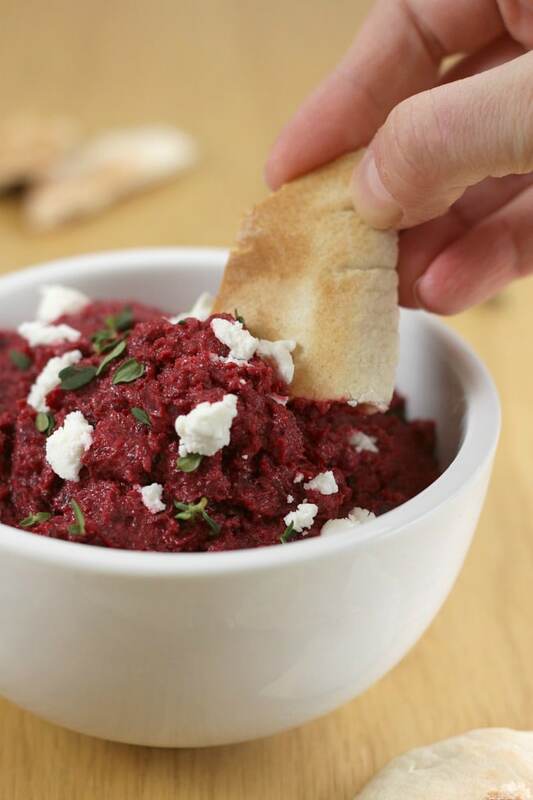 I think this is a clever way to use pre-cooked beetroot and the colour of the dip is gorgeous. Great idea Becca! My hubby loves beetroot. His favourite cheese is Red Leister but I shall certainly give the goats chees a go as this dish looks very nice. Once again, thank you for recipie.